This page is for the Steam version. 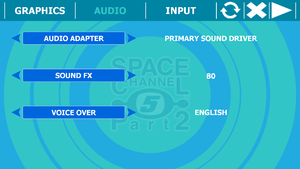 For other versions, see Space Channel 5: Part 2. Updated version of PC re-release of game with more graphical options and fixed issues. Old save file is compatible with newer version of the game, but save game data location is changed simply copy save file from previous location to newer one. Vsync can cause the timing to go slightly "off" occasionally, making the game harder. 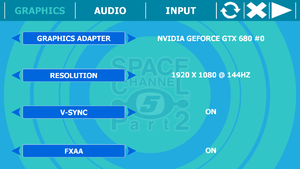 Frame rate is capped at half the refresh rate (e.g. 30 FPS on a 60 Hz monitor). Playing the game above 60 Hz will cause the game to play too fast and mess up timings. 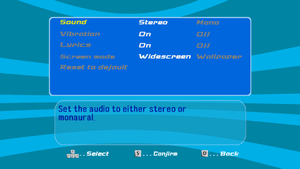 Ulala's Dance mode will play fine above 30 FPS. 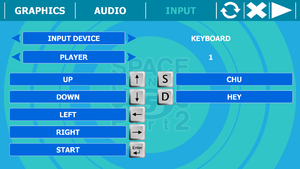 Configuration tools input tab with keyboard. 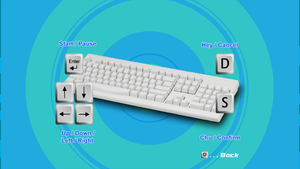 In game setting window for keyboard. 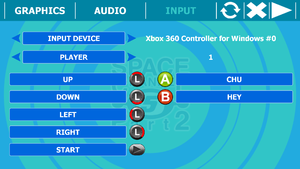 Configuration tools input tab with controller. 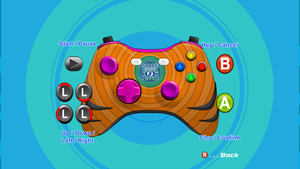 In game setting window for controller. Commands bound to the left joystick will also be bound to the D-pad. Only lyrics. Toggleable from in-game settings. Japanese voice acting has been put back in as an option, as well as Japanese FMV's. One player controls movement while the second controls "Chu" and "Hey" commands, basically splitting regular game controls between players. Open the configurator and select Japanese for the voice over under the audio tab. Launch the game and close it. Open the configurator and then select English for the voice over. Go to the "Display" Control Panel. Press "Change display settings" tab, then press "Advanced settings". Go to the "Monitor" tab, select "60 Hertz" for "Screen refresh rate:" under "Monitor Settings". Exact steps vary slightly depending on your Windows version. The above is for Windows 7. If the save game data folder does not exist, create it and the game will save. ↑ 2.0 2.1 File/folder structure within this directory reflects the path(s) listed for Windows and/or Steam game data (use Wine regedit to access Windows registry paths). Games with Steam Cloud support may store data in ~/.steam/steam/userdata/<user-id>/71260/ in addition to or instead of this directory. The app ID (71260) may differ in some cases. Treat backslashes as forward slashes. See the glossary page for details. This page was last edited on 31 January 2019, at 18:43.